My Mom Thinks She’s My Volleyball Coach…But She’s Not! For all of us that love watching volleyball but have a tendency to get a little too involved in the game. For those of us that cross the line between supportive fan and obnoxious spectator. This book will serve as a gentle and hilarious reminder that… Coaches Coach, Officials Officiate, Players Play, and Parents Parent (cheer, hug, encourage, help transport, feed). 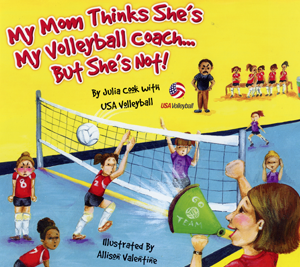 Written by an experienced volleyball mom and USA Volleyball, this book is designed to make the volleyball court a much more enjoyable place for us all to be. Includes tips from USA Volleyball for parents, coaches, players, and officials.